(Sale, London, Sotheby's, 23 March 1971, lot 107); (Yvonne Tan Bunzl); purchased by NGA, 1971. French Master Drawings of the 17th & 18th centuries in North American Collections. Art Gallery of Ontario, Canada, 1972, no. 149, ill. p. 98, pl. II (color)(cat. by Pierre Rosenberg). NGA Recent Acquisitions 1974, no. 52 (as Rachel and the Idols). NGA Master Drawings 1978, p. 67 (as Rachel Carrying the Idols). From Fontainebleau to the Louvre: French Drawing from the Seventeenth Century. Cleveland Museum of Art, Cleveland, 1989, no. 58 (as Creusa Fleeing Troy). Renaissance to Revolution: French Drawings from the National Gallery of Art, 1500-1800. National Gallery of Art, Washington, 2009, 52-53, 277, no. 17 (color). Brejon de Lavergnée, Barbara. 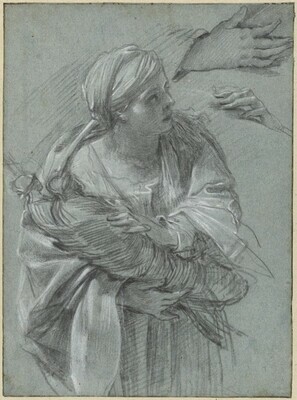 Dessins de Simon Vouet: 1590-1649. Musée du Louvre, Paris, 1987: 127, no. XCIX. McCullagh, Suzanne. "Cleveland, Cambridge, and Ottawa: Seventeenth-Century French drawings." The Burlington Magazine 132 (1990): 234-235. Rosenberg, Pierre. "Review of From Fontainebleau to the Louvre: French Drawing from the Seventeenth Century." Master Drawings XXVIII (1990): 432-433. The Burlington Magazine 132 (1990): 79, repro. Martinez, Benjamin and Jacqueline Block. Visual Forces: An Introduction to Design. 2nd edition, Englewood Cliffs, NJ, 1995: 131, fig. B.